”At the point when words blur, music talks.” Do you feel your melodic ability or music office is blurring without end? Well at that point it’s a great opportunity to buzz up your music aptitudes with a delectable music site. 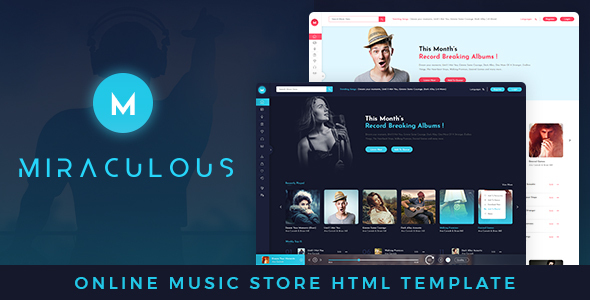 Miraculous Online Music Store HTML Template is a streaming music service. By which you can play any song at any time. Miraculous Online Music Store HTML Template is designed very neat and clean, and 100% responsive. The template is designed in a such a way that you can use this for any online music or video streaming store. The template has dozens of unique features and layouts which empower you to create professional music store. The Miraculous Online Music Store HTML Template welcomes you with an awesome designed home page, The left sidebar contains the menu, which helps you to navigate to another page. There are a Login and registration button at the top, it open with a beautiful popup. There is a search bar at the top of the header. On the home page, you can check the recently played song, this will also show the Weekly top 15 songs list, Featured artists, Latest release, Features album, Top Genres and live radio. The Miraculous Online Music Store HTML Template has awesomely designed footer, which is divided into 4 blocks. In the footer, you can give a link of your android application and there is a newsletter block, and in the last block, you can display your contact information. We also have a download page, by which your customers can download or purchase the song from this website and can save to their online playlist. You can make many playlists on this online store, and even you can queue the songs. There is a feature to change the quality of songs, as your customers want to listen they can change the quality.